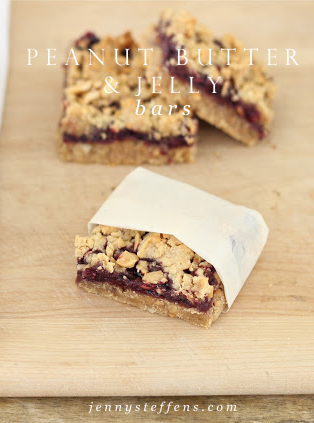 Another inspiration from The Barefoot Contessa... Peanut Butter & Jelly Bars. I highly recommend you only make these if you have someone or multiple people to share them with. They are good. Crave-able good. In fact, just writing about them right now is making me crazy for them. It is settled. I'll be making another batch of them today. I think I'll have one, save one for Mike, then take the rest over to the neighbor's so I don't finish them off before the end of the day. Jenny : Should I add oats to these to make them kind of healthy? Jenny : Ya, you're right. Nahhh. But, then they would be sort of like breakfast bars. I could eat them for breakfast. Mike : They're cookies, you won't want them for breakfast. Jenny : Ya, you're right. They are everything you'd hope them to be. 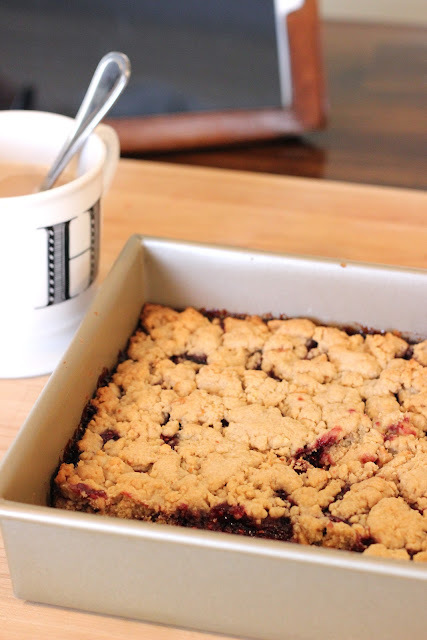 Dense, peanut buttery, and crumbly with a layer of sweet raspberry jam that has thicken in the oven. For a peanut butter fanatic, they are divine. Let me know if you try them with oats - I'd love to hear how it goes. I did nothing differently from the original recipe except I used chunky PB and added extra nuts to the top. I like the crunchy texture they add. Oh, and this is just half of the original recipe. There is no need to tempt yourself by an entire large pan of these. No need. In a mixer, cream together butter and sugar for 2 minutes. Add vanilla, egg and peanut butter. Mix until well incorporated. Add flour, baking powder and salt. Mix together on low, just until incorporated. Grease a 9x9 pan. Put 2/3 of the mixture in and press it into the bottom. Spread the jam over the dough layer. Add the chopped peanuts to the remaining 1/3 of the dough mixture. Mix it together (with your hands) until the peanuts are mixed in. Crumble the mixture over the jam layer. Bake at 350 for 30 minutes. Let it cool for 20 minutes before cutting to let the jam set. It is basically a peanut butter cookie dough. Press 2/3s of it in the bottom of the pan. Spread the jam. When it cooks, it bubbles up and thickens into a chewy gel. So good! these are beyond amazing, and i was just talking about them this weekend! i think i need to get to baking! Hi I am South African and do not know how many grams/ cups/ tablespoons 1 stick of butter is. Please help as I would love to bake these treats! Ingrid - A stick of butter is equal to 1/2 cup or 8 tablespoons. Good Luck! I have been enjoying following your lovely blog. You are a talented delight. I have to make these bars today! I wish I could click on a tab and print out the recipes. Any way you could add this feature, so I could just take the page with me into kitchen and get busy. I have made many of your recipes and want to make a pillow now. You have inspired me! ok so funny! I just discovered your blog this morning and ironically made these last night...kindred spirits? love your blog and story. thanks for sharing! I made these for my co-workers today and they loved. Thanks for the great receipe. Oh, these are good! I just made a batch and used oats instead of the extra peanuts in the crumble (I didn't have peanuts on hand) and they turned out perfectly dressed as an acceptable 'breakfast' bar...visible oatmeal=breakfast food. Nevermind that I used Biscoff Spread instead of peanut butter too. Because you totally can't see that and you certainly CAN see the strawberries in the jam (Hello! Fruit and whole grains! )...again, perfectly respectable breakfast bars. If you're a champion like we are. Thank you dear lady for sharing! Jenny, just had to say thanks...this took care of dessert last night, breakfast this morn, and lunch this afternoon...I think I need to hide them from myself!